Well, we all know why we need food. But have you ever tried to look at it from another point of view? What else can you do with food? It can be a great source for inspiration. Some food products contain natural food colorings that can help you create wonderful patterns on milk or water. Just take some colorful candies and drop them into a plate - magic is here! Chocolate is a great food to create wonderful and delicious crafts. Take an old plastic bottle (yes, this is one more way to recycle old plastic bottles) and pour inside some melted chocolate. Place in it in the fridge... done! Amazing chocolate cola bottle is ready to be filled with yummy candies and served as a unique dessert. Egg shells are so strong that they can withstand the weight of a grown-up man - ask an adult to try! 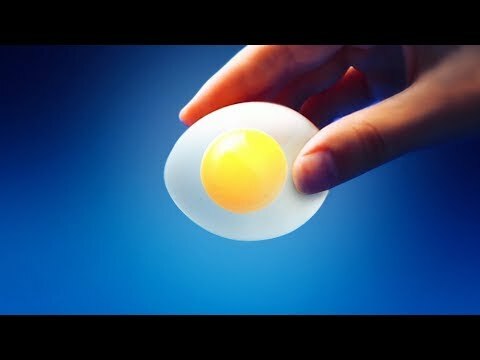 Try to place an egg in a cup of vinegar and see what will happen. Cool, isn't it? Just don't try to eat it now. And don't forget to watch this video till the end to discover seven truly awesome ways to make DIY edible lipsticks and lip balms.